Just about the only one watching at Wayne Webb’s Columbus Bowl and on ESPN who didn’t know what was coming next was Graham Fach. Wham! 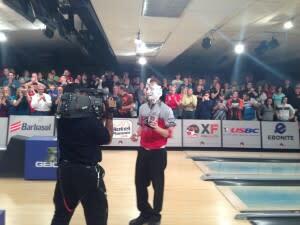 The traditional shaving-cream pie in the face, courtesy of Barbasol, one of the sponsors of the event. Fach, 24, can be excused for his lack of knowledge about what comes next after winning a PBA major. This was only his second-ever PBA event and he’s the first Canadian to win on the PBA tour. Fach’s big win on Sunday ended a dramatic, action-packed week of bowling at Wayne Webb’s Columbus Bowl. Fans from near and far had an up-close and very personal view of the top bowlers in the world. The license plates in the parking lot showed the PBA Players Championship has a strong local – and national – draw. There were plates from at least 12 states other than Ohio, from as far away as New York, Maryland – and one from California. The Gagne family came from Saratoga Springs, New York: Joe and Kim and their sons, Macallan, 8, and Jamison, 5. “I just like watching the bowlers,” said Macallan, who has a 137 average and a high game of 208. If he one day makes it onto the PBA Tour, he’ll know what’s coming if he wins. Macallan already knows how to determine who’s hot and who’s not: “I look at their backswing,” he said. About 400 fans filled Wayne Webb’s Columbus Bowl – and the number could have easily been 1,000 or more if there had been room. Stands were set up on either side of and behind the lanes that were used during the competition, and the fans were within a few feet of their bowling heroes. There was total and absolute silence as a bowler prepared to launch a shot. As the ball rolled down the lane, the cheers began slowly, gaining momentum as the ball neared the pins. The screams and shouts reached ear-splitting levels at the moment of impact. “This has been an amazing week,” said Wayne Webb, 56, one of the sports all-time greats. Wayne has won 20 PBA Tour titles and five PBA50 Tour titles and is a member of the PBA Hall of Fame. Injuries have slowed Webb the past few years, but he’s on the comeback trail and bowled in the qualifying rounds of the PBA Players Championship. “I somewhat held my own,” said Webb, who was decked out in a very colorful outfit that included a loud, striped tie and matching pants. Loud bowling clothes are his trademark. He signed plenty of autographs and posed for a lot of photos. 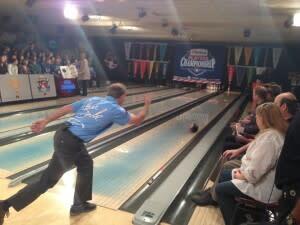 Professional bowlers are very approachable – and Webb did his share to promote the sport he loves. “It’s fun,” he said of his outfit, a remark that pretty much summed up the entire week of bowling. Five bowlers qualified during the preliminary rounds for the Sunday final that was televised on ESPN. It was a step ladder format, which meant No. 5 and No. 4 squared off in the first match, with the winner taking on No. 3. The winner of this game took on No. 2 and that winner – Fach – took on No. 1 for the title. Fach was seeded No. 2 – and beat No. 3 Sam Cooley of Australia 247-244. This set up the final against Ciminelli, one of the top bowlers in the PBA. “I told myself, don’t miss and was lucky I missed later than he did,” Fach said. He began the final with six consecutive strikes, 11 in all, with only one spare. Ciminelli began with three strikes, but a spare in the fourth frame put him in a hole he could never quite dig himself out of. “The support we had all week was amazing,” Webb said of the fans, volunteers, his staff and the ESPN crew. And now that it’s all over, Webb and his staff can get back to their normal routine.